One does not always have the inspiration to make interesting sides or wait for some vegetables to get cooked before eating. This was such a time. We made meatballs from minced hen meat in the oven and could not get ourselves to come up with any interesting side for that and especially we did not want to cook any more food at that time. 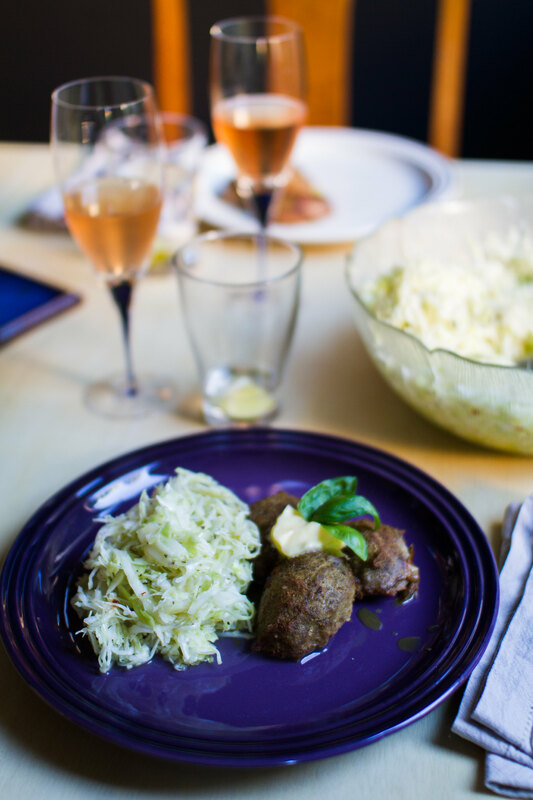 Fortunately for us we had made white cabbage pizza salad earlier and could enjoy that together with the meatballs. Hen meat balls and pizza salad. It was a while since we ate hen meat. It is quite difficult to handle in a nice way. It is next to impossible to make patties and fry them and equally difficult to try making a ragout. Primarily since the meat is really fatty and sticky before it is cooked. 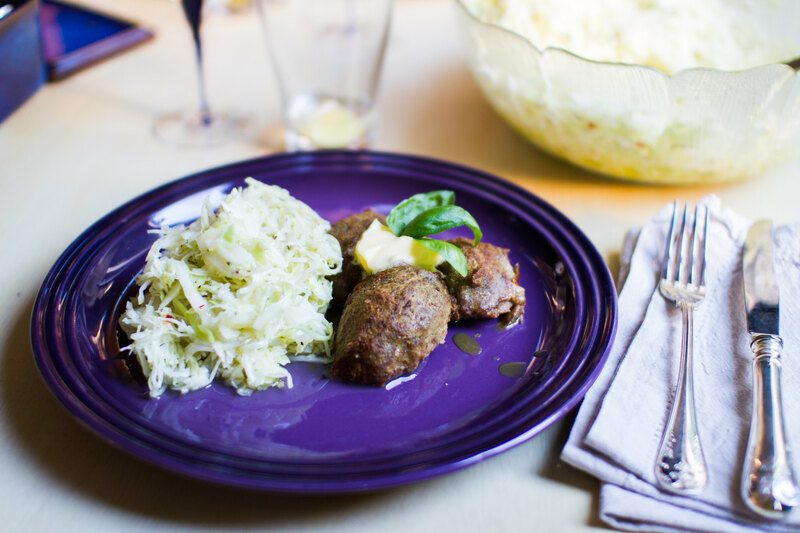 Our favourite way of cooking minced hen meat is as meat balls in the oven. Compared to the other alternatives it is reasonably easy to form the meat balls from the cold minced meat and then the oven handles the rest, perfect. One note here is that the meat should be cold for it to be as easy to handle as possible. When it gets warmer it gets slippery and the fat starts to interfere even more with one’s effort to make create any type of geometric form. Topping the hen meat balls with a click of butter. Yum! This time we seasoned the meat balls with curry, cumin, pepper, cayenne pepper and salt. Mix the spices together with the meat in the ovenware used for cooking the meatballs and then form the balls in that same ovenware. Simple and no need to dirty any more bowls or plates. The meat balls were cooked in the oven at 170 °C for about 45 minutes. The hen meat can get quite dry since all the fat quickly releases from the meat itself, so make sure to add some butter when serving. What do you do with minced hen meat? Any other favourites that you would like to share? Please leave a comment!